WITH overseas-based standouts swamped with club duties, Patrick Deyto once again takes the spotlight as the Philippine men’s football team’s last line of defense in the Asean Football Federation Suzuki Cup. Neil Etheridge of England is trying to make a good first impression with his new club Oldham Athletic, while Filipino-German Roland Muller is listed, but will only be available in the knockout stage after the end of Swiss club Servette FC’s season. That makes Manila-based Deyto the starting goalkeeper for the Azkals when they vie for top honors in the Suzuki Cup kicking off on Saturday. The Azkals’ first match is against Laos. Deyto’s Global coach, Leigh Manson, believes his ward is ready for the challenge after being honed by Azkals and Global goalkeeping coach Jorge Kuriyama of Mexico, a relationship that has resulted in the student winning the Golden Glove award in the recent United Football League FA League Cup. The 6-foot La Salle product also had the chance to play against top-striking Global teammates Mark Hartmann and Izzo El-Habbib. “He’s facing the likes of Mark and Izzo, shooting at him every day,” Manson said, noting that the 24-year-old Deyto is still far from his full potential. 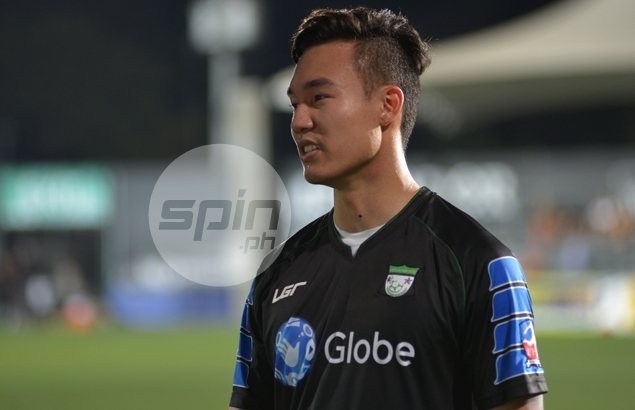 “I think in two years’ time, you’ll see a real Philippine-based goalkeeper who’ll give the foreign-based ’keepers a real run for their money, because of the quality of the training he’s getting day in and day out,” Manson added. But Deyto has already shown he can deliver in the present, with his stellar showing in friendlies. Tomas Trigo of Soccerro is the other goalkeeper who Azkals coach Thomas Dooley is expected to bring in the Suzuki Cup.